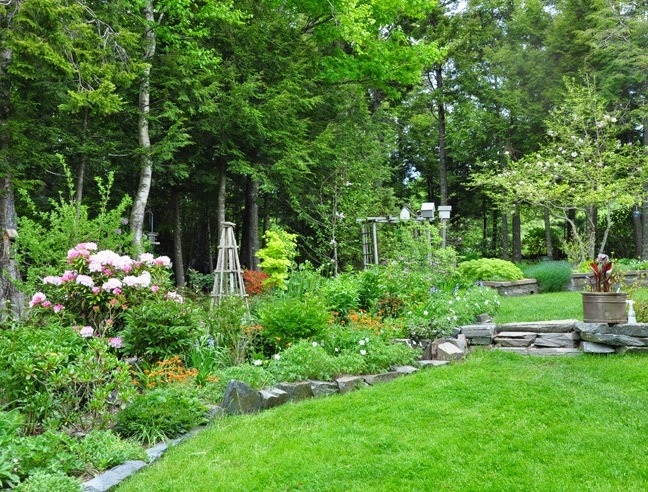 Providing a privacy screen at the front of Duff and Donna Ever's house is a narrow band of trees and shrubs. 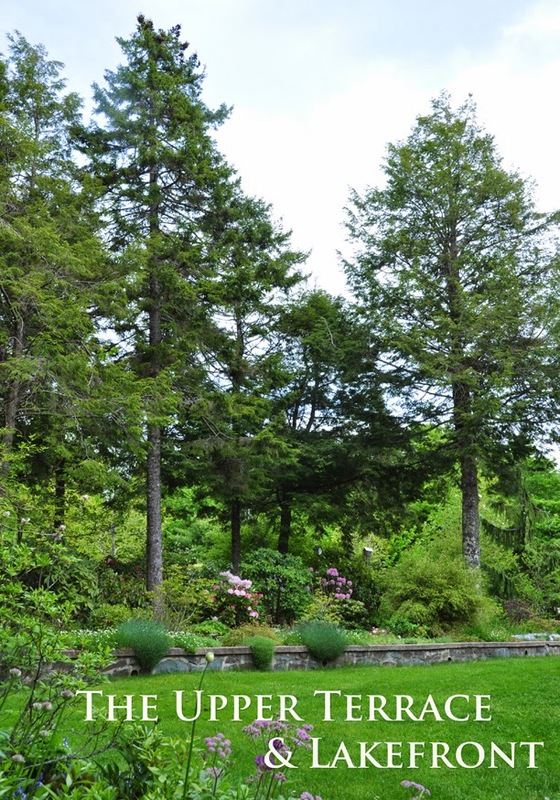 Underneath the tall evergreens is a path that meanders through a woodland garden. 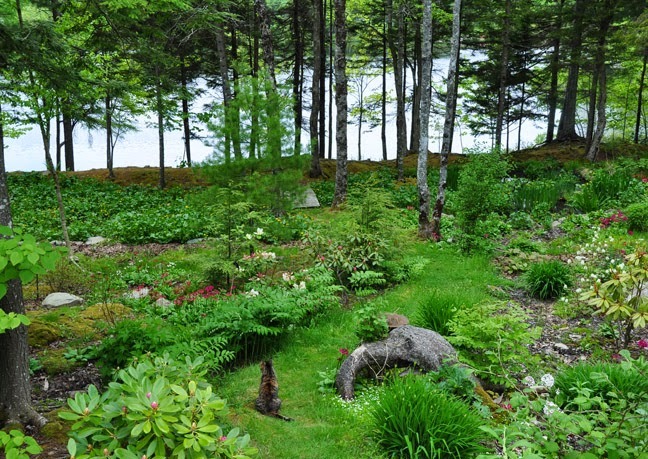 On the outer edge of the woodland garden, there is a low stone wall that runs along the edge of the lawn. Donna tells me that: "The area along the walls get full sun. 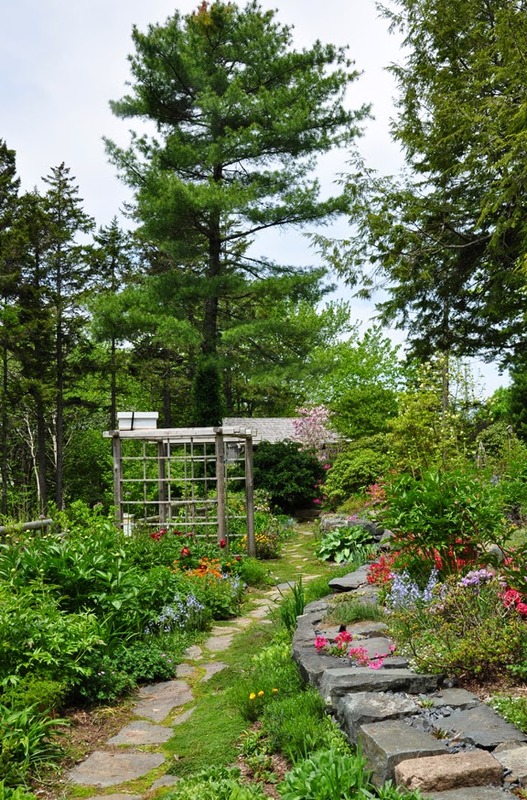 It is filled with spring blooming plants and bulbs- a lot of them ephemerals. 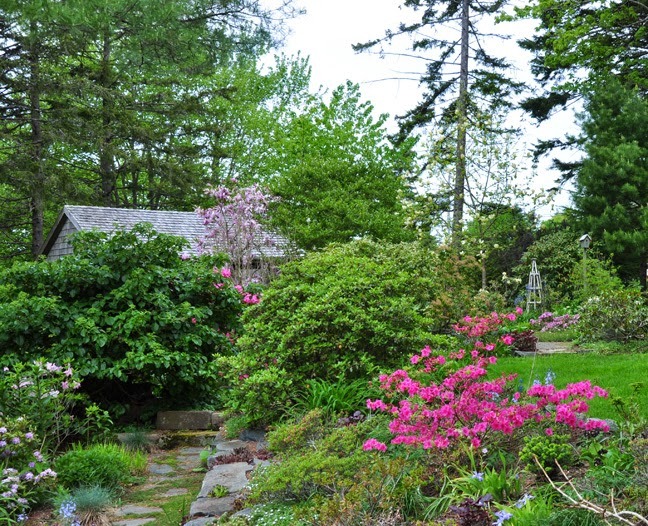 Azaleas and low growing rhododendrons share this space. In mid-summer, the daylilies take over followed by asters in fall." 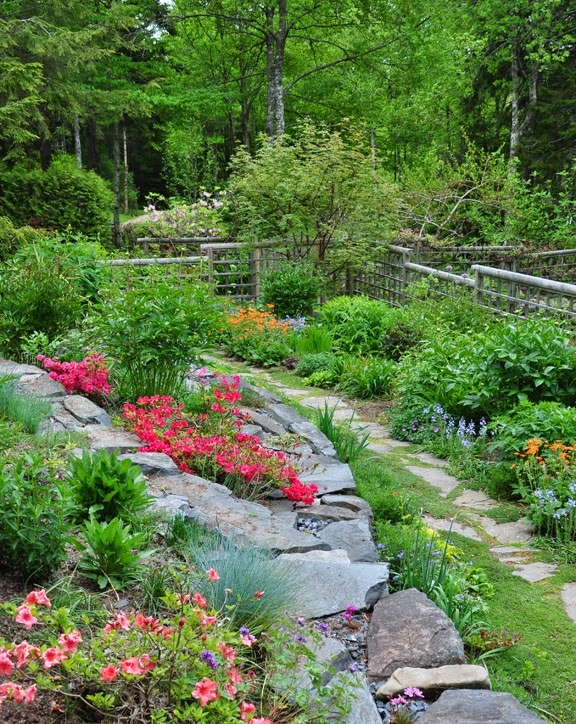 "Initially we planned only to garden along the stone wall, but once again, we got carried away. We made paths which twist and turn around the rocks and through the trees. We limbed-up the old native hemlocks to let in more light and then added Rhododendrons, Magnolias, Pieris, Viburnum and hydrangea. 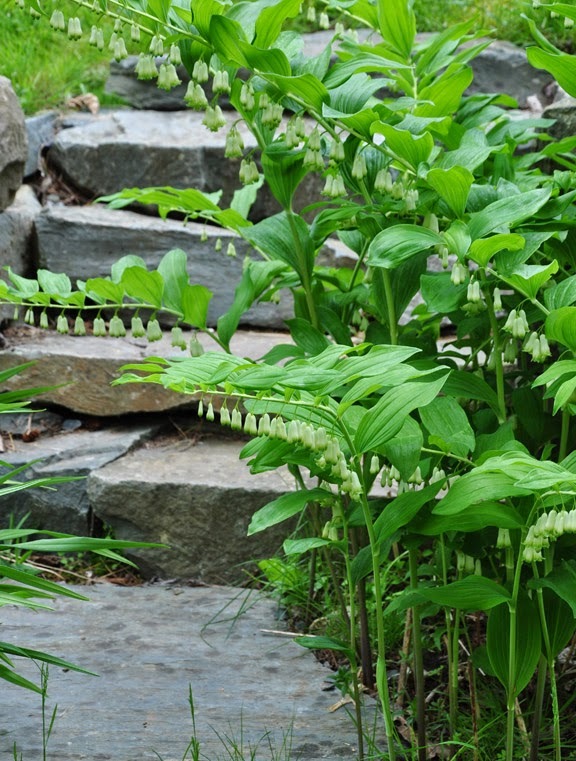 Lady slippers, Trilliums, Anemone and Arisaema are some of the perennials that share this space." "We have planted some primulas in the damp pockets throughout this garden. A clump of Lilium canadensis is doing well, fingers crossed. Old stumps are left to become planting pockets for ferns." "With the exception of a yearly mulch of shredded leaves, this garden requires little maintenance." The soft mauve flower is Creeping Moss Phlox 'Emerald Blue'. The orange buds are an azalea which Donna tells me is a cross made by a friend. 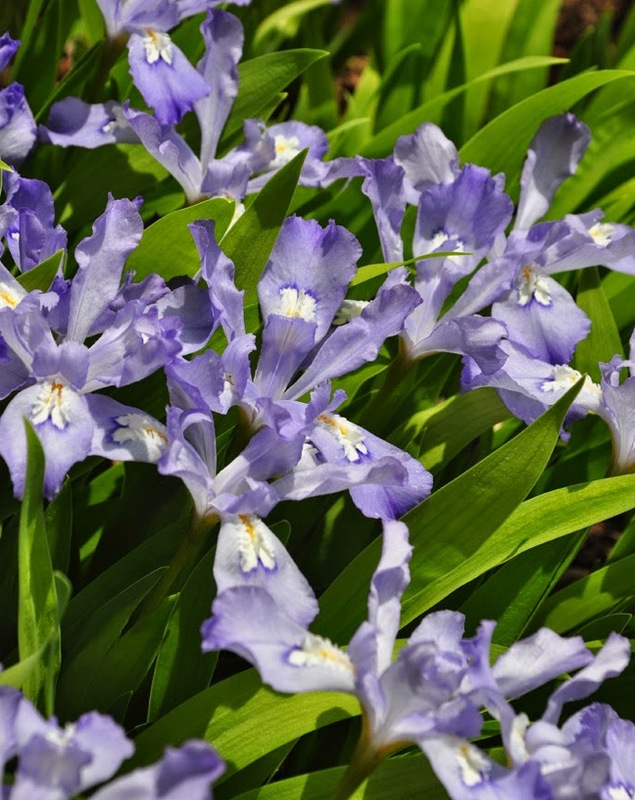 Dwarf Crested Iris, Iris cristata: has pale mauve-blue flowers with gold-crested falls. In the right location, this iris will spread quickly to form a dense colony. Iris cristata prefers light shade and moist soil, but it can be grown in dry shade as well. If grown in a sunny spot, the soil needs to consistently moist for this iris to flourish. Height: 15-30 cm (6-12 inches). USDA zones: 3-9. Donna:" The blue color is electric. This is an easy to grow spring bloomer. I've been spreading little bits of it all over the gardens. It likes bright light and the moist, well-drained soil all the gardening books talk about;-)"
Donna: "This plant came from Fraser's Thimble Farm. It is the case of "the wants" every time I look at their catalogue. 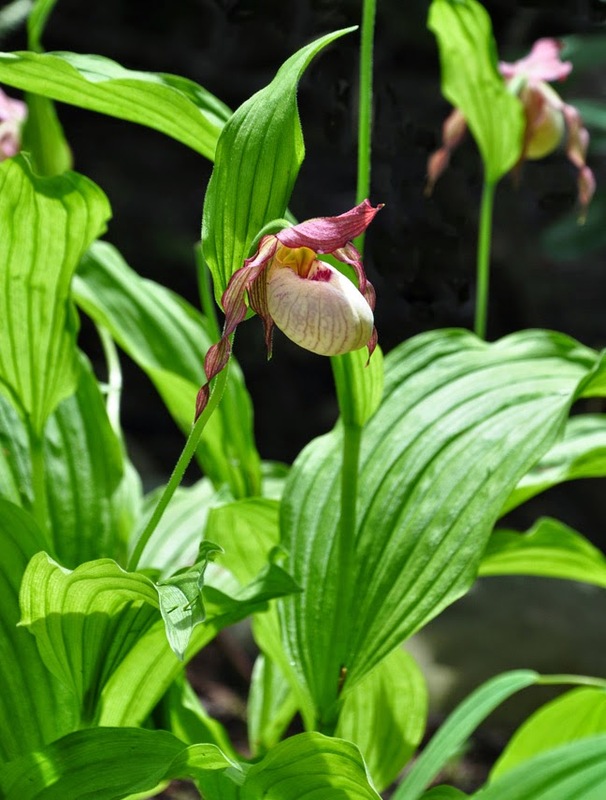 We grow several Cypripediums and I am always happy to see their noses poking out of the ground in early spring." 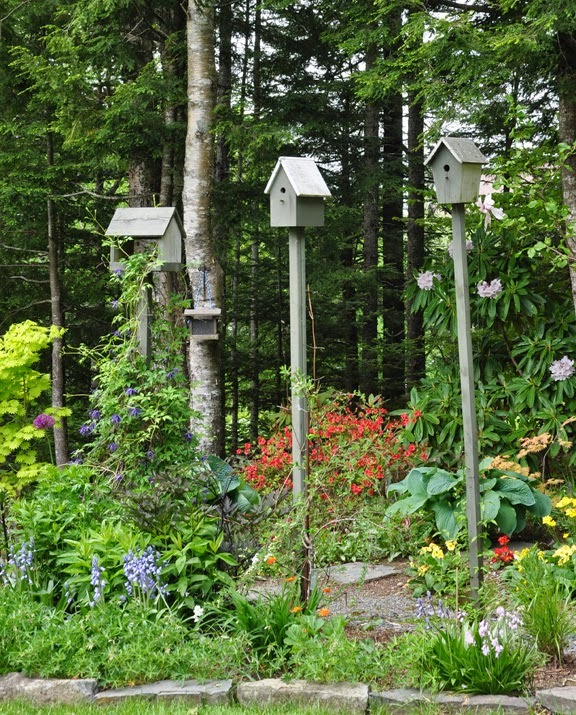 "The birdhouses serve a double purpose. The chickadees nest in them and it is great fun watching them raise their little ones. We string wire from four corners of the birdhouse to the bottom of the post. 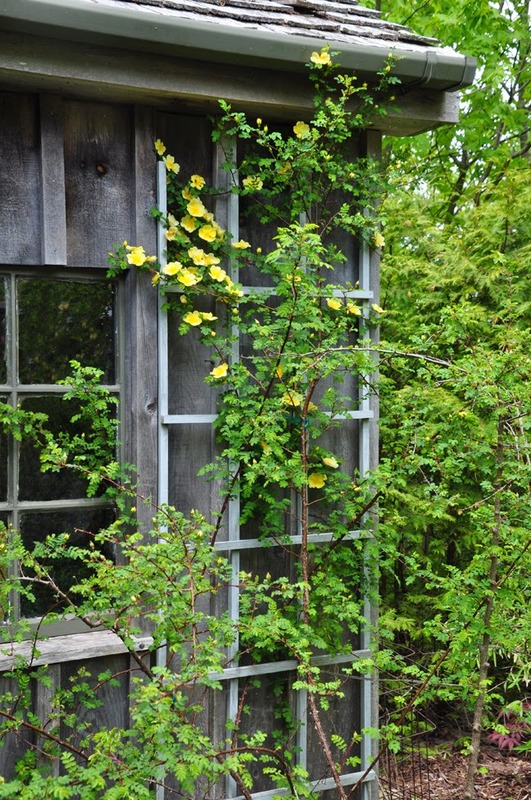 This provides support for a clematis...."
"You can always garden-up should you run out of room at ground level. The chickadees don't seem to mind. We feed the birds year round. We have hummers, nuthatches, a variety of finches, jays, woodpeckers, flickers and mourning doves. Nothing exotic, but the garden is always full of birds." 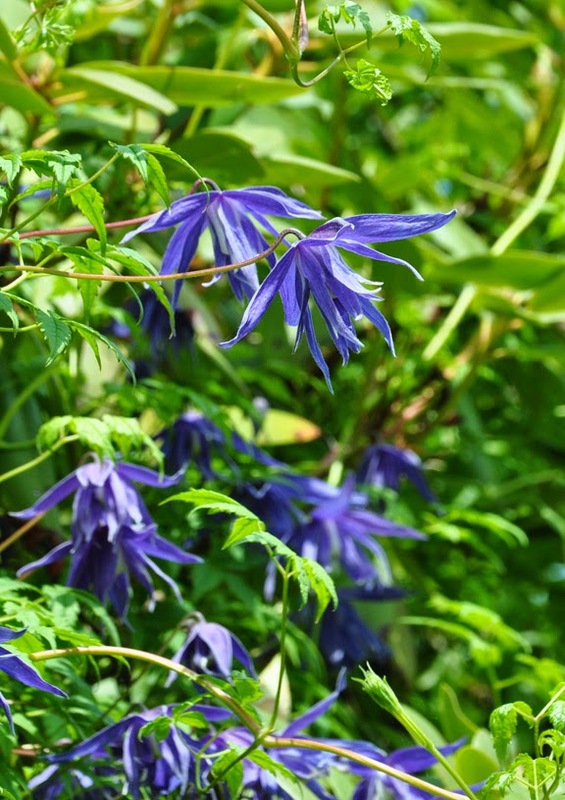 Clematis macropetala 'Bluebird': has nodding, bell-shaped, purply-blue semi-double flowers. 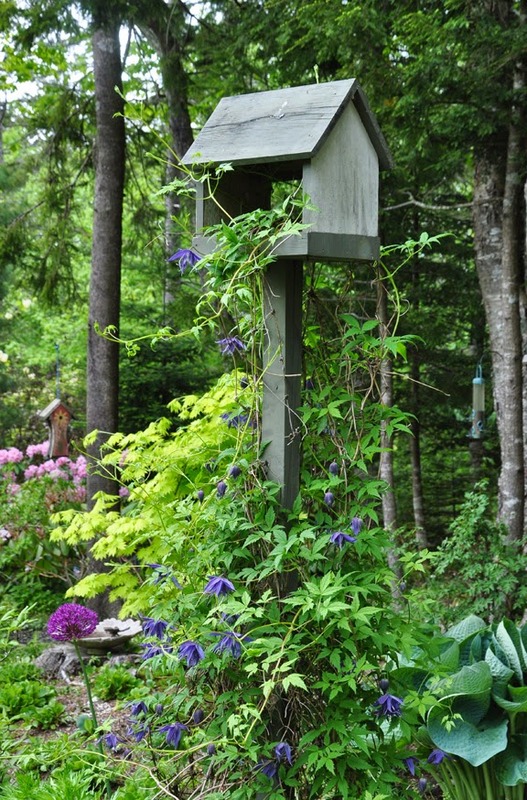 This is a Group 1 Clematis that blooms in spring on the growth of the previous season. 'Bluebird' requires 4 to 6 hours of sun each day. Height: 8-10 ft. USDA Zones: 4-8. "Duff made the benches, the arbours, the obelisks, the birdhouse, the chairs, the fences, the deck, all the stone wall, the troughs and the patio. I have been asked if he can be cloned:-)"
"There are two yellow magnolias near the shed. The one closest to the shed is M. Yellow Lantern and the other one is M. Hattie Carthan." 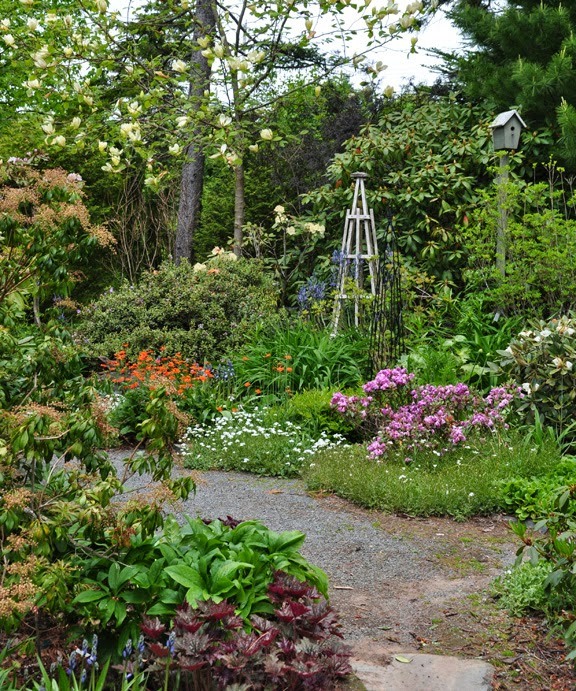 "In spring this garden is full of Crocus, Chionodoxa, Hellebores, Rhododendrons and Azaleas. Along the front of the border is Geranium'Kashmeri White'. Then it is poppies and alliums. Summer blooms are lilies and dark-leafed Chocolate Eupatorium. Yes, we do have lily beetles, but I hand pick them off. I can't imagine the garden without lilies. Later it is Echinacea, Phlox and Purple Dome Aster." "Duff made the chairs 20 years ago. They were unfinished cedar and for years they were a weathered shade of grey. The yellow paint has given them a few more years... The coffee cups tell it all. It is a great place to sit and watch the birds in the birdbath." 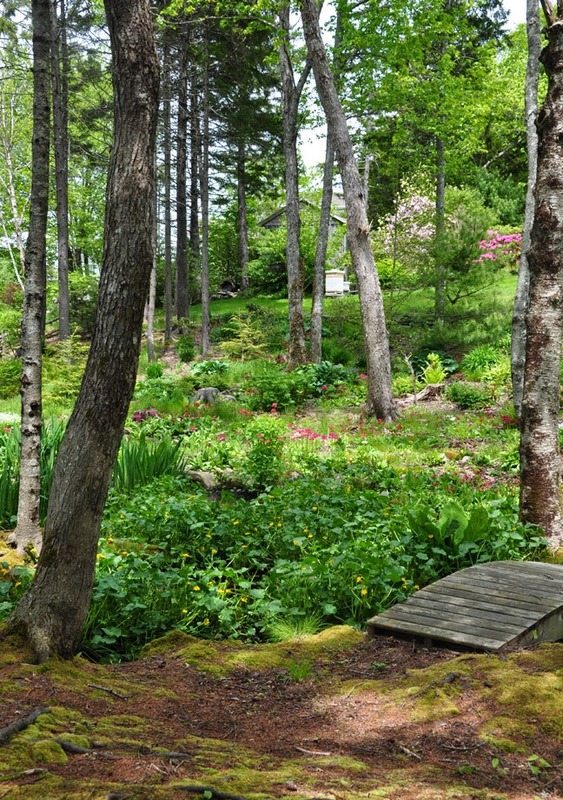 Donna says that she and Duff did not intend to garden along the lakeshore. They removed some of the more scruffy spruce and maples to open up a view to the lake and then called it a day. This woodland area became the spot that they dumped surplus plant material that resulted from plant division as well as plants that had for one reason or another fallen out of favour. When Donna and Duff finally ran out of room in the rest of the garden, they turned their attention to their "dumping ground". Donna: "To date, we have not amended the soil. We have just planted among the roots and the rocks. 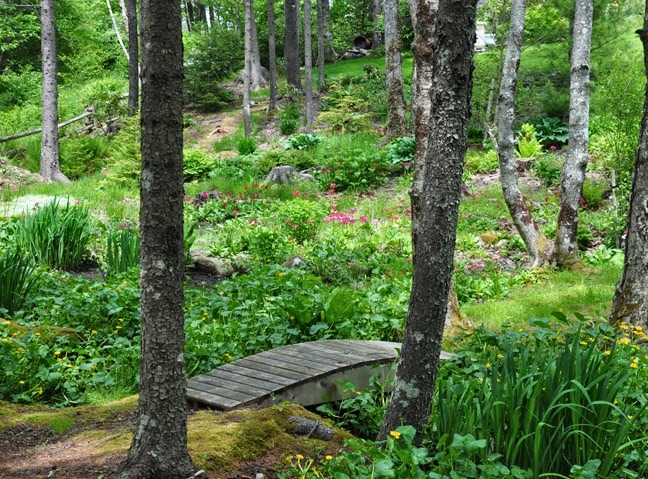 We have a central path leading to the lake and this year Duff put in steps and two boardwalks so it is easier to walk around and enjoy this wild garden." Donna: "Just when you think spring will never arrive Caltha palustris (Marsh Marigolds) fill the bogs. The bees are even happier than I am to see the yellow flowers. The blossoms hum with bees." 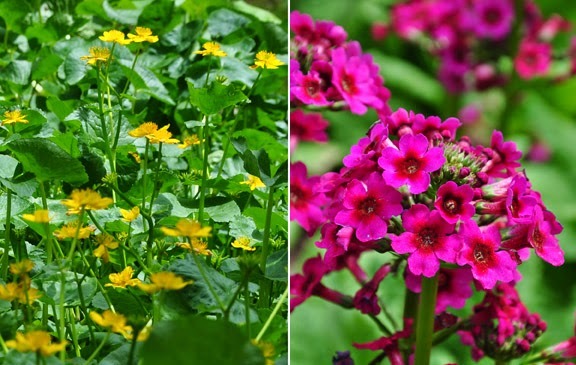 "Primulas have also done well. 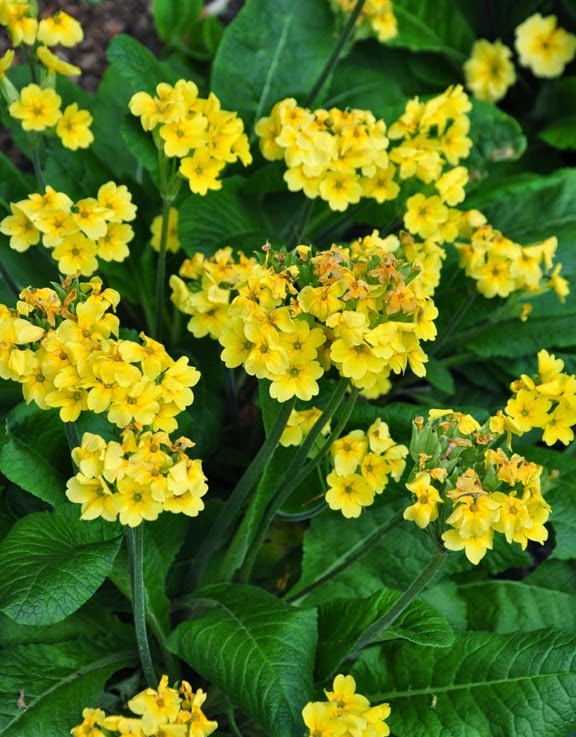 We started with three Primula Japonica, gifts from a gardening friend, and now there are three hundred or more- all self-seeded. They fill my heart with joy." Lysichiton (Skunk cabbage) both white and the yellow form also like the moist conditions found here. 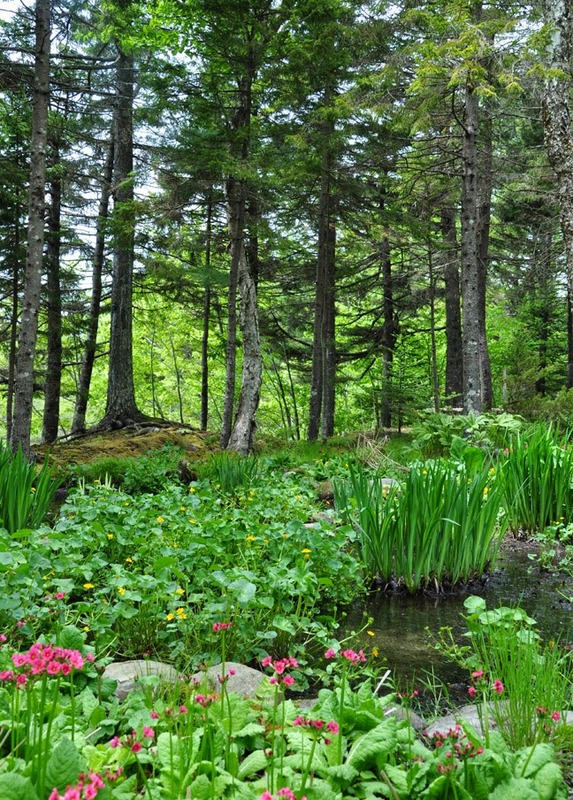 Siberian iris, Sweet Woodruff, Filipendula and Darmera peltata all grow well in this area." 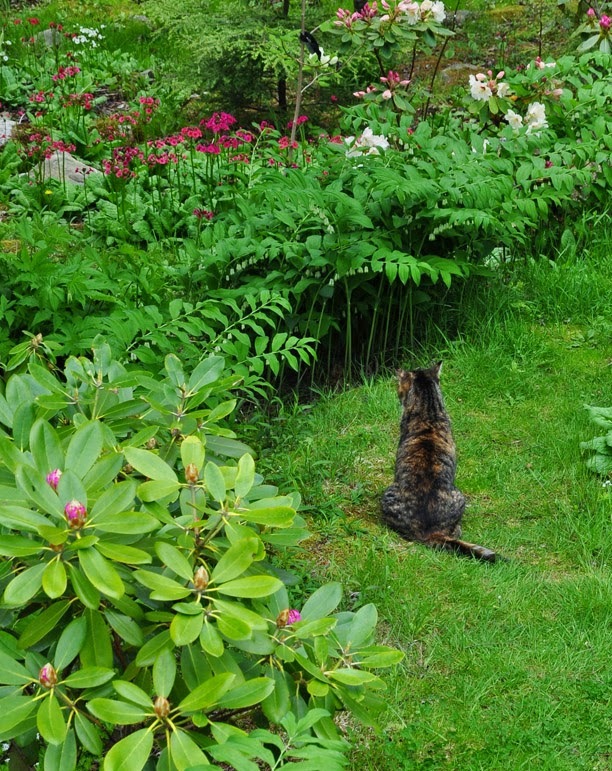 In the foreground left is a rhododendron, in a curve sweeping to the right is a line of Solomon's Seal, Polygonatum. Behind the Solomon's Seal is pink Candelabra Primula, Primula japonica. Missed part 1? Here's a link. Some of us are still waiting impatiently for Spring to arrive. Believe it or not, there was a light dusting of snow on the ground this morning! We need to replace our garden shed and so this book cover grabbed my attention. I'd love to have a similar green roof on our new shed. 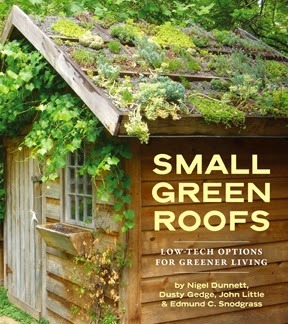 This book contains 40 illustrated profiles of small green roof designs with details on design, construction, installation, care and maintenance. This guide to outdoor design by the editor of Pith + Vigor features 23 unique garden styles intended to help you find your personal garden style. 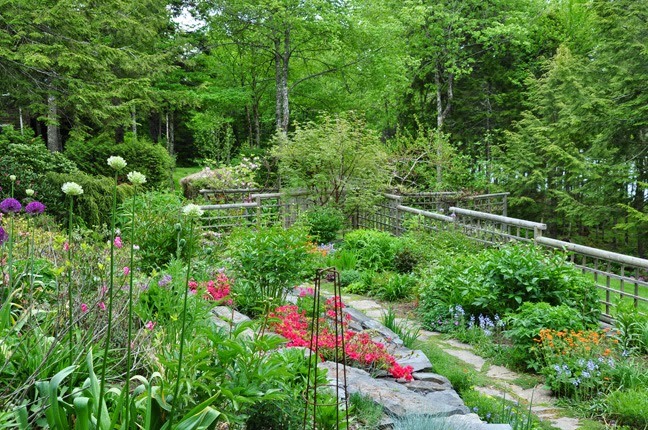 There are lessons and tips in gardening and design, as well as step-by-step projects. Worthy of note: this book contains over 1,500 photographs to inspire you. 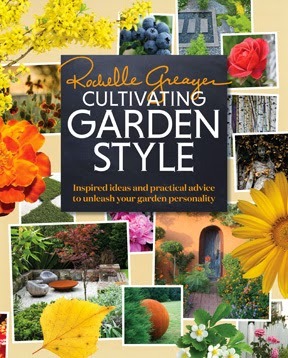 This is a series of books covering: Asters, Epimediums, Ferns, Sedums, Snowdrops and Tulips. 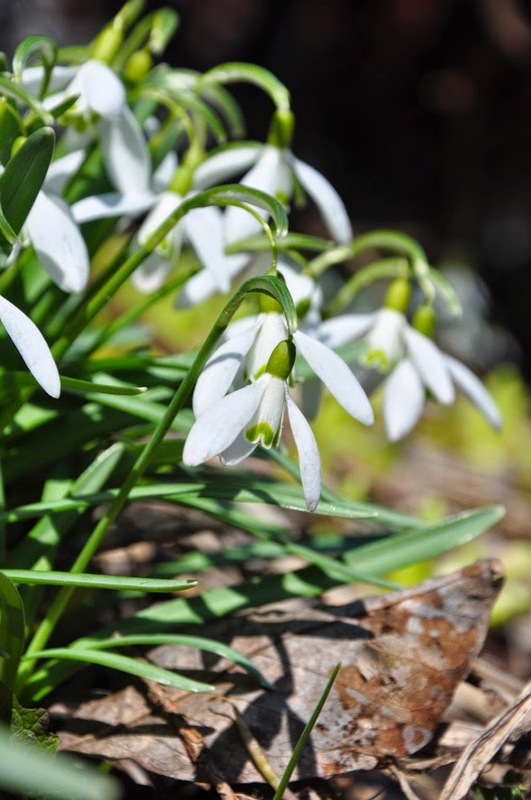 Carolyn of Carolyn's Shade Gardens, who is a snowdrop expert among other things, did a very favourable review of The Plant Lover's Guide of Snowdrops. The New York Times describes the series as "lavishly illustrated." 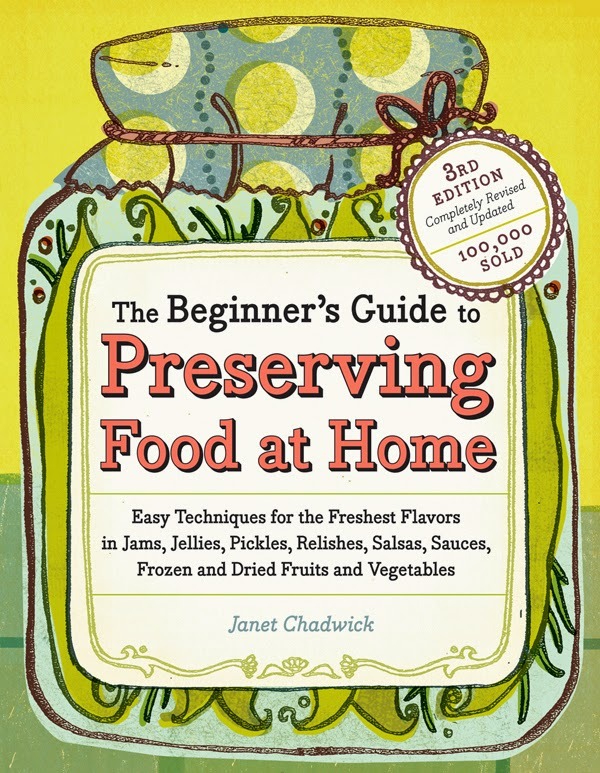 This bestseller promises to take the fear out of canning, which is reassuring to people like me who are novice canners. The book covers best techniques for canning popular fruits and veggies. I like the idea that preserving summer's harvest extends beyond jams and pickles. 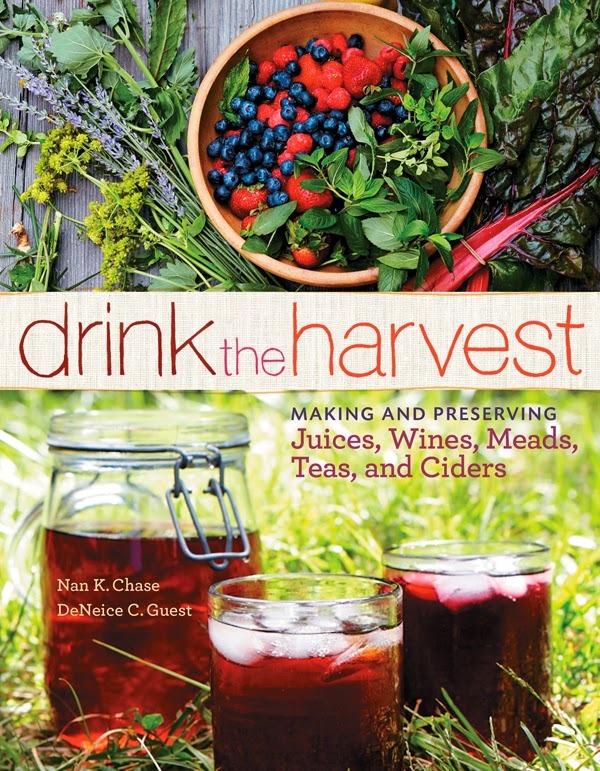 This book covers juices, ciders, wines, teas and syrups. There are also tips and growing and harvesting the necessary ingredients. 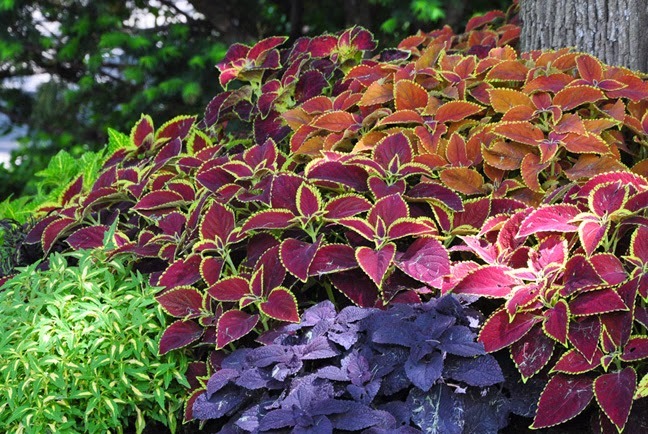 Did you know that 2015 has been named as the Year of the Coleus by the National Garden Bureau (USA)? 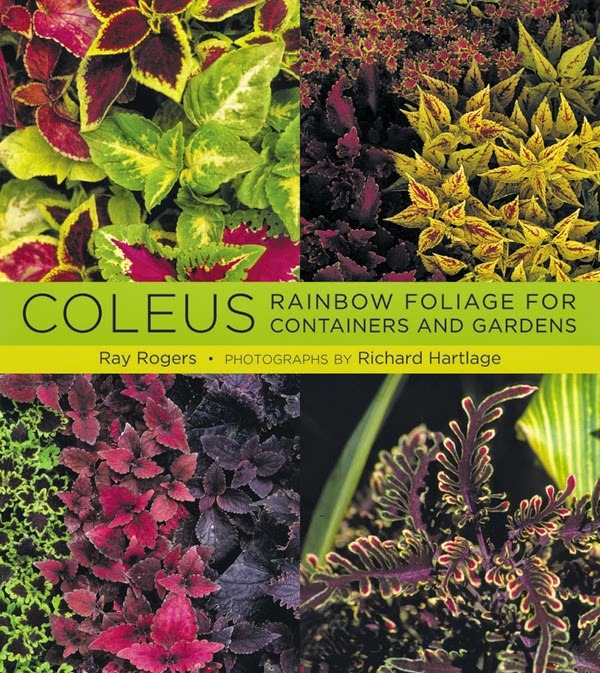 With 225 varieties of Coleus featured in its pages and tips of propagation, care and use, this book covers just about everything you might want to know about the plant of the year. Moist shade, is one thing. Dry shade is double the challenge. 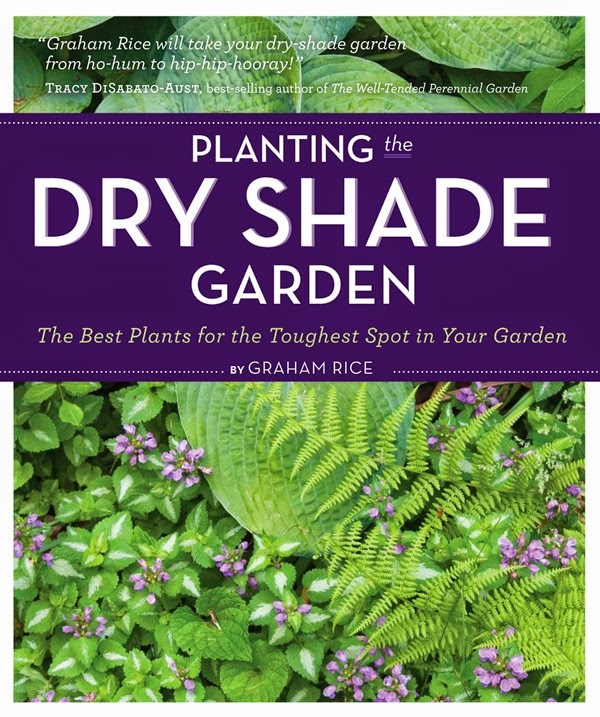 A good chunk of my back garden is dry and shady, so a guide that highlights 130 plants that do well with reduced light and moisture, would be a handy reference. This book explains how to plant and grow tomatoes, as well as offers tips on how to control pests and diseases. Author Craig Lehoullier has spent over 30 years trialing tomatoes and highlights his top 10 tomato varieties. 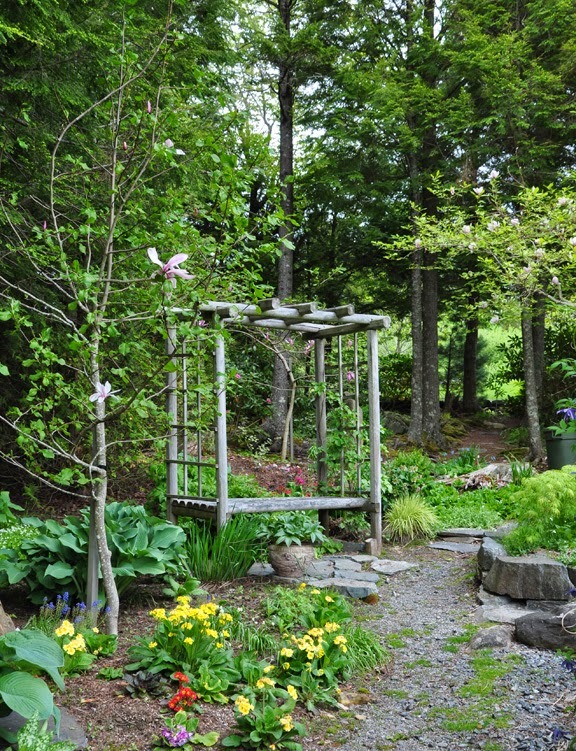 For those of us still waiting for Spring, a garden art project might help keep us sane! 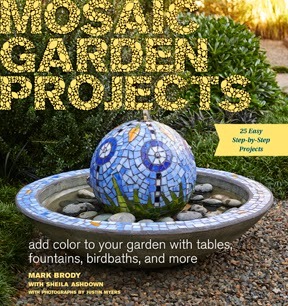 This book covers the basics of making a mosaic and has 25 projects with step-by-step instructions. 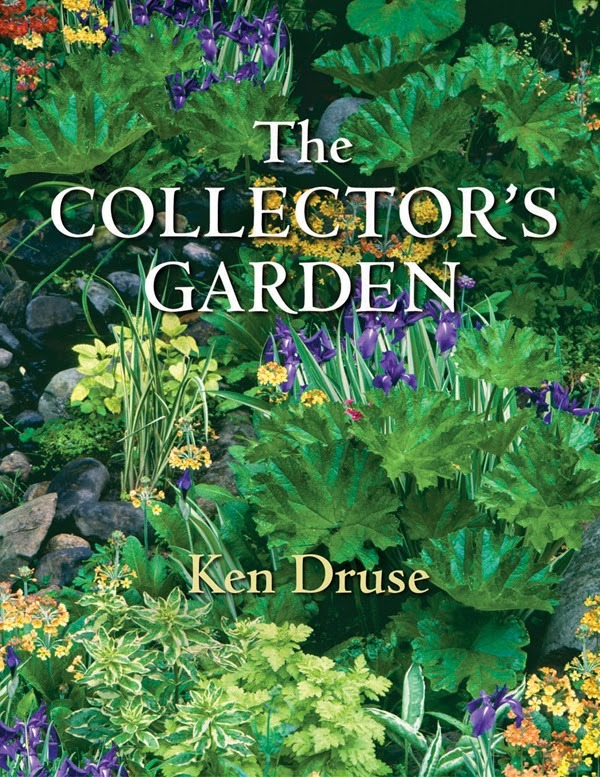 In The Collector's Garden author Ken Druse studies 28 gardens throughout the world that have a plant driven focus. 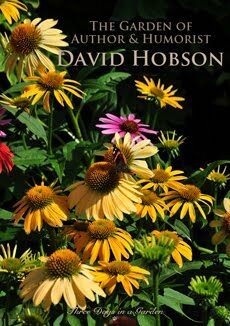 Natural Companions, The Garden Lover's Guide to Plant Combinations is second book by Ken Druse. It features stunning photographs by Ellen Hoverkamp. 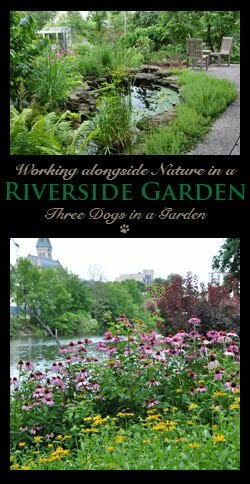 This book, which I reviewed back in 2012, went on to be a bestseller and won a gold award from the Garden Writers Association. 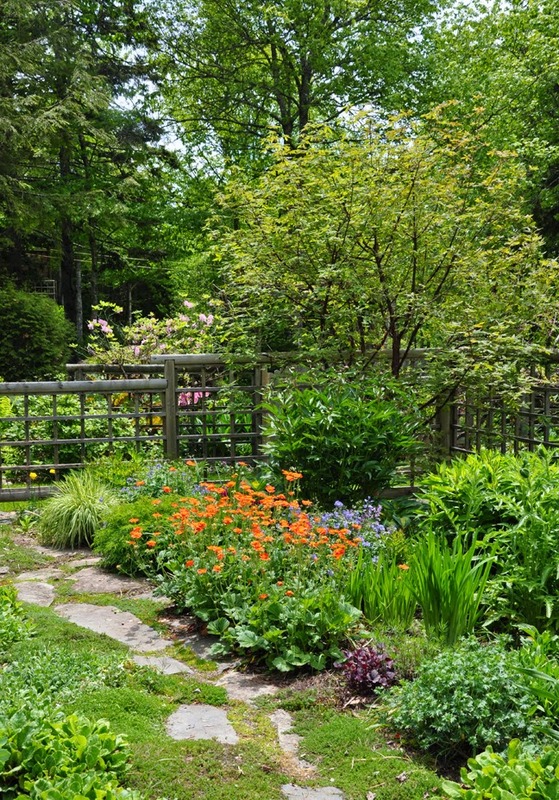 The Layered Garden shows gardeners how to layer plants with beautiful photographs of Culp's Brandywine Cottage Garden as illustration of the concept. 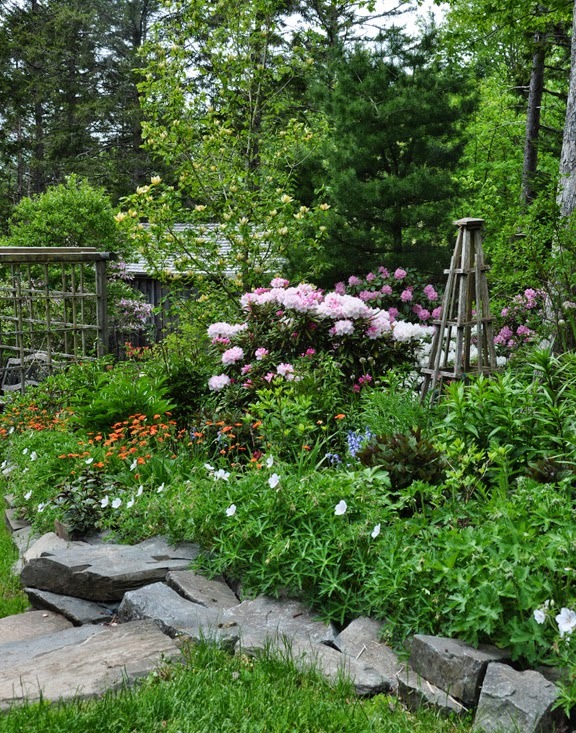 Below is an image of Brandywine Cottage's walled garden. Two years ago I started growing some moss and was surprised and pleased by the results. Now I'd like to learn more about growing moss. 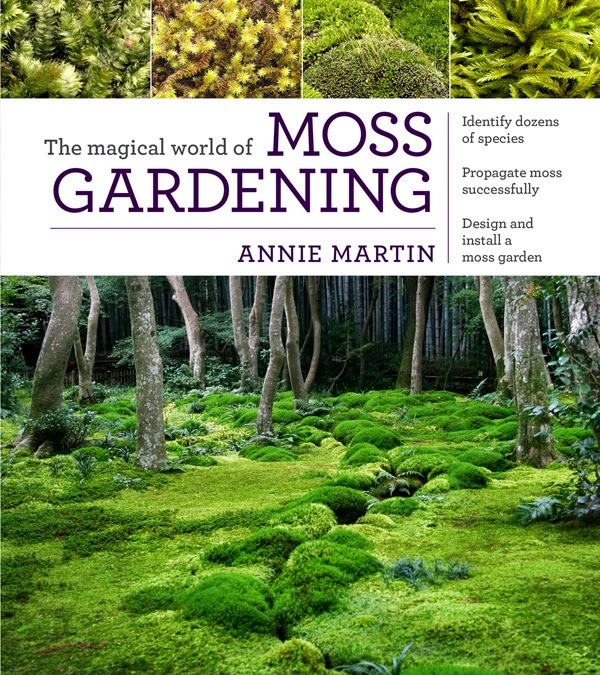 This book, by expert Annie Martin, covers the basics: tips on designing with moss, as well as planting and maintenance. During the late fall and winter I lavish attention on my houseplants, but by summertime, they are looking forlorn and neglected, baking in the sun of my dinning room window. "Indestructible" could prove useful adjective in coping with my seasonal neglect! 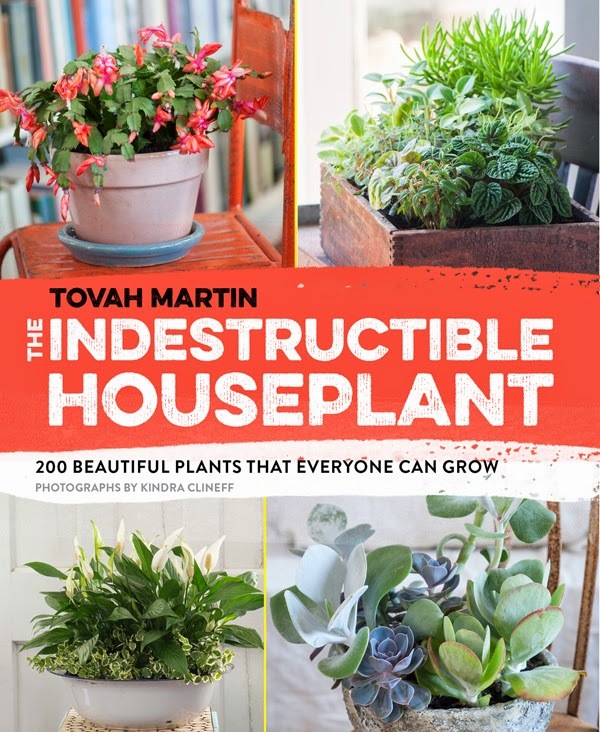 In this book author Tovah Martin highlights indoor plants that are tough, beautiful, and readily available. In addition to plant profiles there are there are tips on care, maintenance and creating eye-catching indoor displays. Disclaimer: This selection of books is entirely of my own choosing. 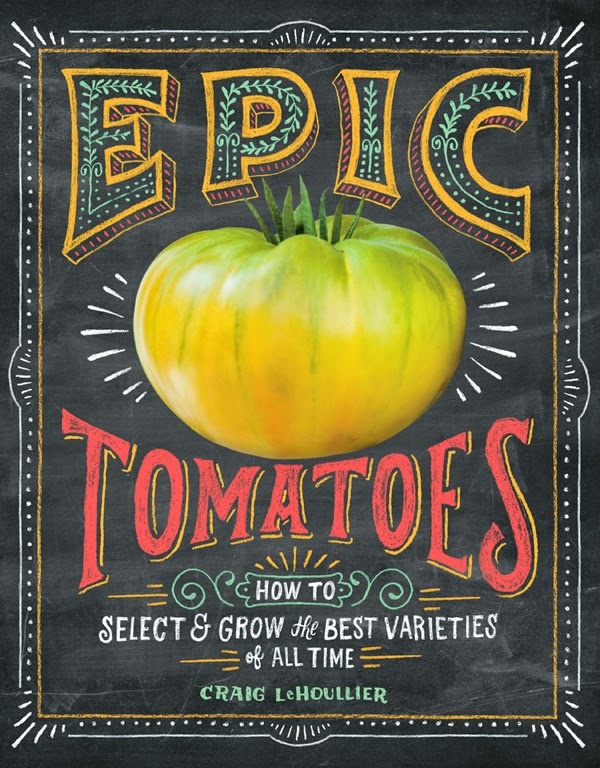 I did receive a copy of Epic Tomatoes: How to Select & Grow the Best Varieties of All Time by Craig Lehoullier at the Garden Writers Association (Chapter 7) annual lunch that I am going to give away to one lucky reader. If you would like to be entered in the draw to win Epic Tomatoes please leave a comment below. 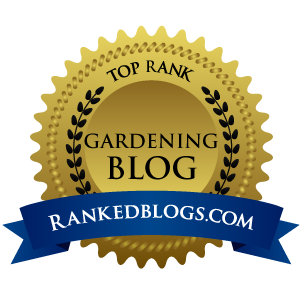 If you are a non-blogger and would like to enter please leave a comment on the Three Dogs in a Garden Facebook page (link to Facebook in the right sidebar). Please make sure there is a way for me to get hold of you by Facebook or email! I am still struggling to contact Bonnie Johnson who won Grow Gardeners in my last book draw. 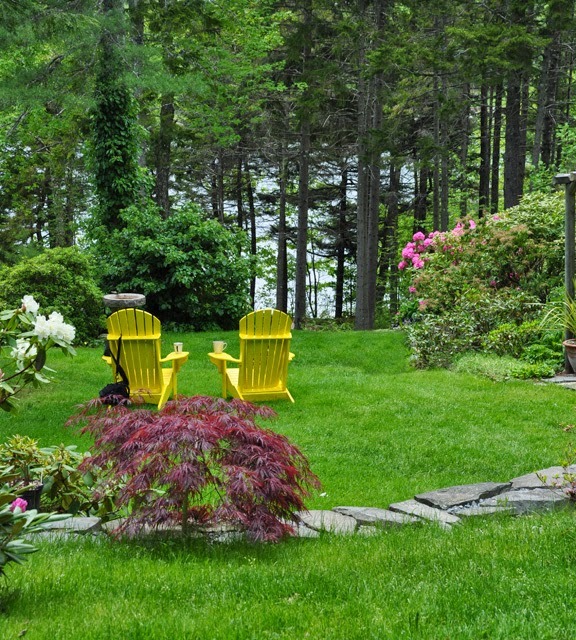 Donna and Duff Evers have the enviable view of a lake which sparkles through evergreen trees at the back of their home near Halifax, Nova Scotia. There is a short plateau of land with a deck and then the property rolls down in a gentle incline to the lake. Is it harder to garden on a slope than a flat piece of land? "There are days my aching bones make me wish I was gardening on a flat plot of land, but on the whole, the positives outweigh the negatives. And we don't have to go to the gym to work out," Donna laughs. To ease the incline the Ever's have terraced the slope with a low stone wall that runs most of the width of the property. As you can imagine, this was no small undertaking. Donna: "The stonework came first and we learned the hard way. Several walls did not come through the first winter and had to be rebuilt. We did things right the second time around. It helps to have a husband who likes working with stone. We handpicked the stone from a local quarry and trucked it home. The walls began with a three to four inch tamped base of crushed gravel. Fitting the stones together was a bit like working a jigsaw puzzle." Marking the outer perimeter of the terraced garden is a square lattice fence. Donna: "The fence in this garden serves several purposes. It defines the garden and separates it from the expanse of grass that is the septic field. 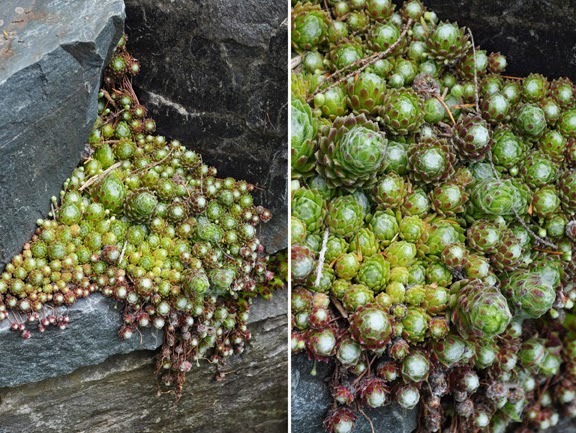 It breaks up the wind from the lake and provides support for all the climbing vines." 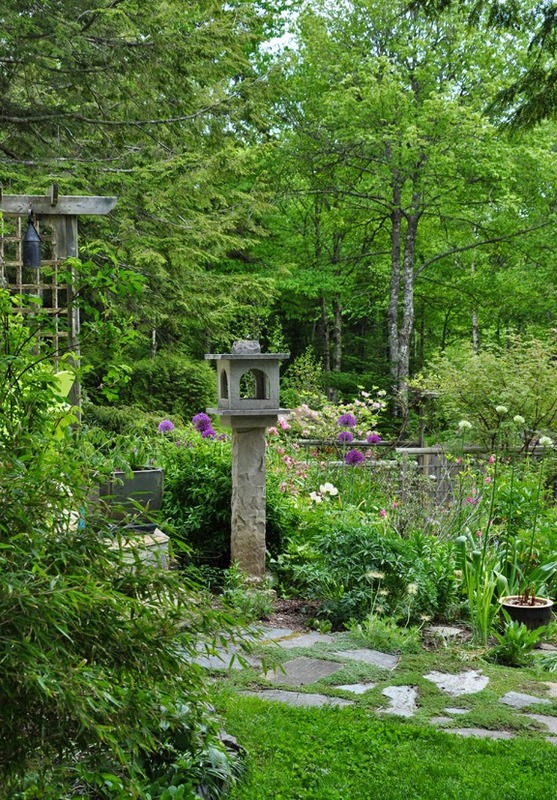 "When making this garden we had to work around a massive stump that was impossible to move. We planted a climbing hydrangea and a clematis at the base of the stump. It took a while, but the hydrangea completely covers up the stump and the clematis now weaves its way through the hydrangea." 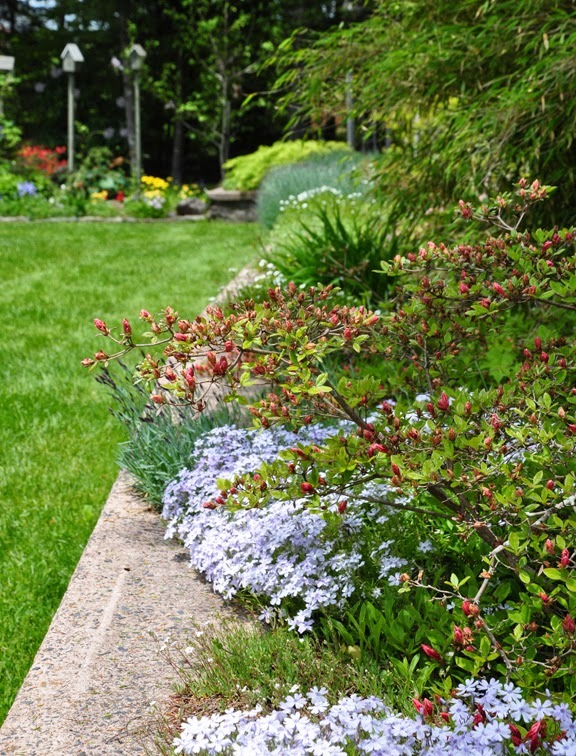 Donna: "Gardening on a sloping property definitely has it challenges. The biggest one is erosion. The terraces and stonework, combined with my obsession for over-planting has taken care of that problem. 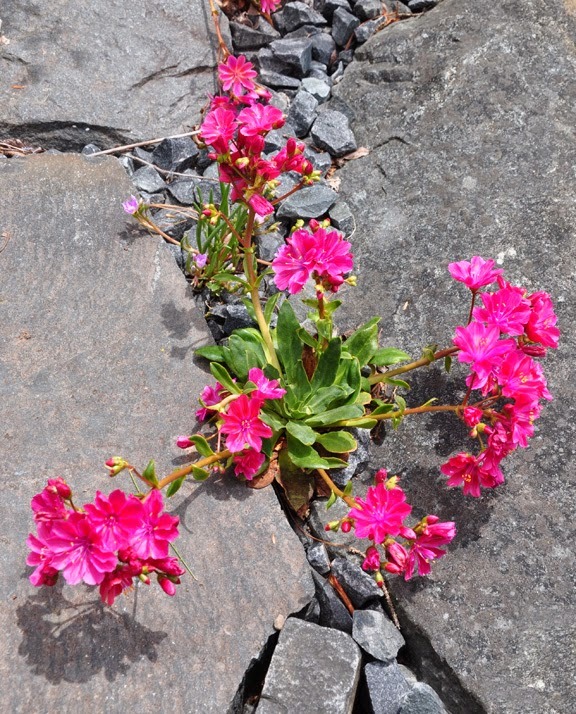 The stone walls with their excellent drainage have provided unique planting sites for Lewisia, Saxifraga and Hens and chicks." Donna: "The walls are a great place to sit with a coffee in the spring sunshine." Donna: "I'd like to think that this plant was evidence of my gardening skill, but the truth is, it's dumb luck. 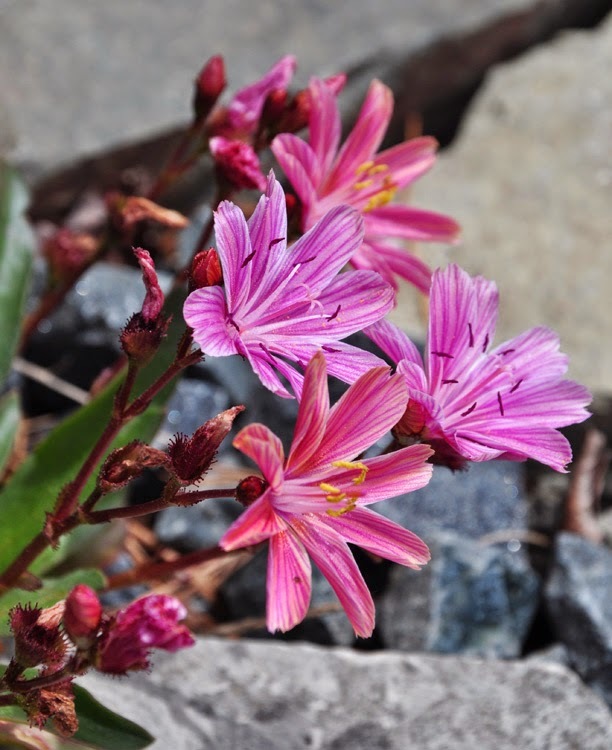 Lewisia needs excellent drainage around the crowns to prevent rot in winter." "I am never certain it will make it through the winter. Fingers crossed! It never seems to be happy on our rock walls. I must give it a little fertilizer this spring." Donna: "The geum is the one everyone grows. 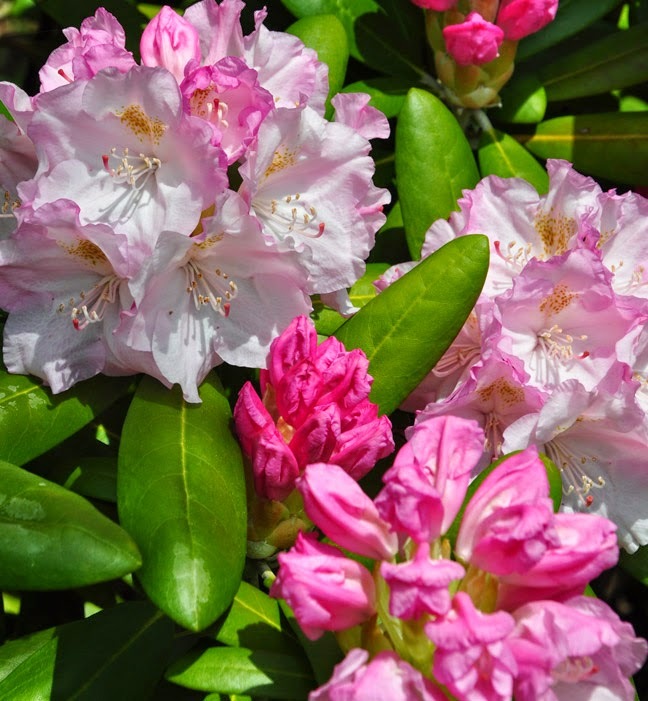 It does really well in our dampish soil and it often has a few blooms again in fall. 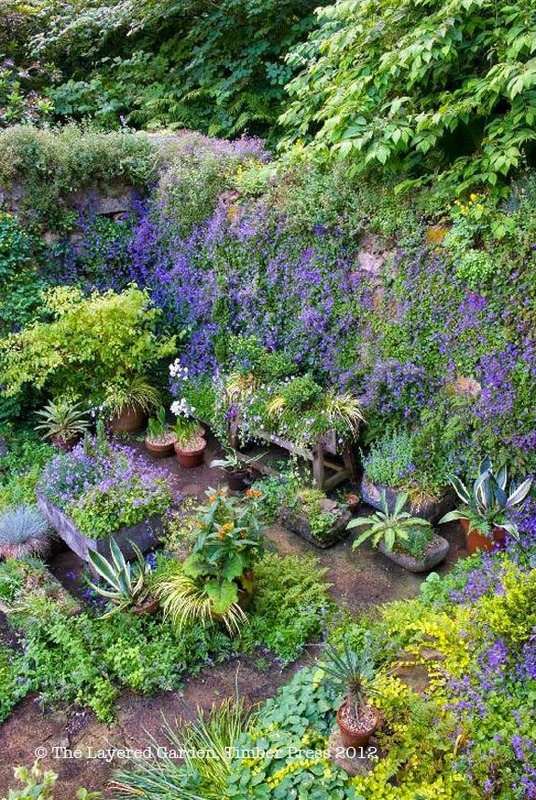 I love it planted with anything blue." 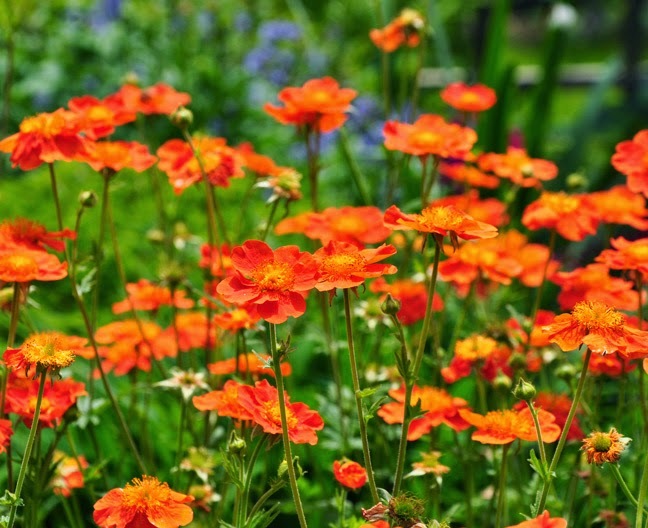 Geum borisii: Forms a low growing clump with sprays of bright orange flowers from early spring into summer. As Donna notes, it may even re-bloom in fall. Part shade and moist soil are best. Height: 30-45cm (12- 18 inches), Spread: 30-45 cm (12-18 inches) USDA Zones: 5-7. Note: Geum borisii struggles with heat and humidity south of zone 7. 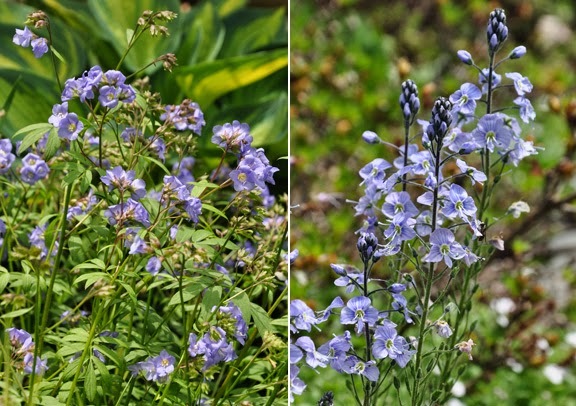 Donna: "Jacob's Ladder, Polemonium (seen above on the right) likes dampish spots in our garden and it has become well enough established that I have been able to divide it and spread it about. 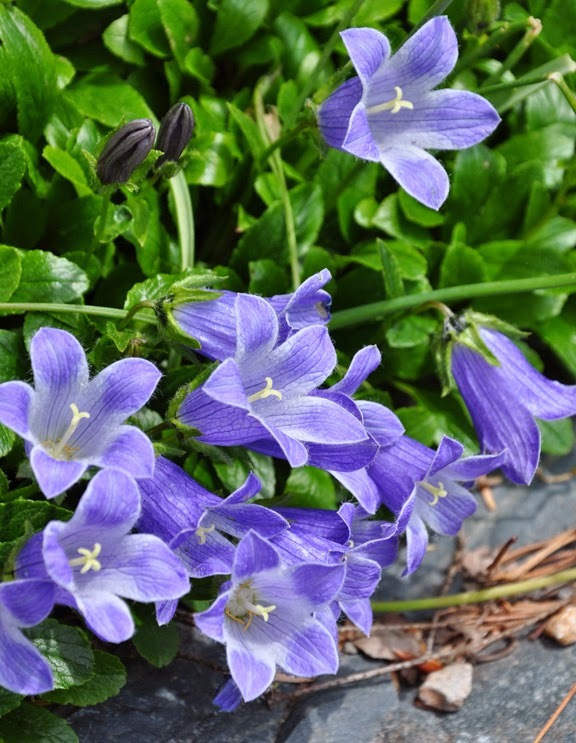 It blooms earlier than other varieties of Polemonium and the foliage seems to be a little more delicate." 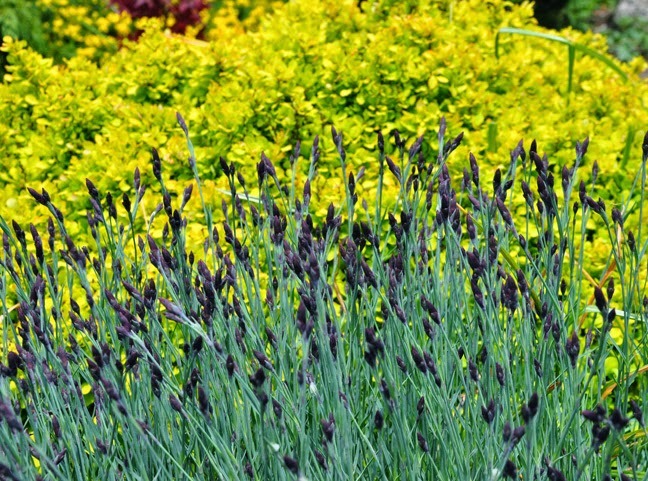 "Veronica gentianoides (seen above on the left) is another spring favourite. I love it planted with orange and yellow geum in the front border. 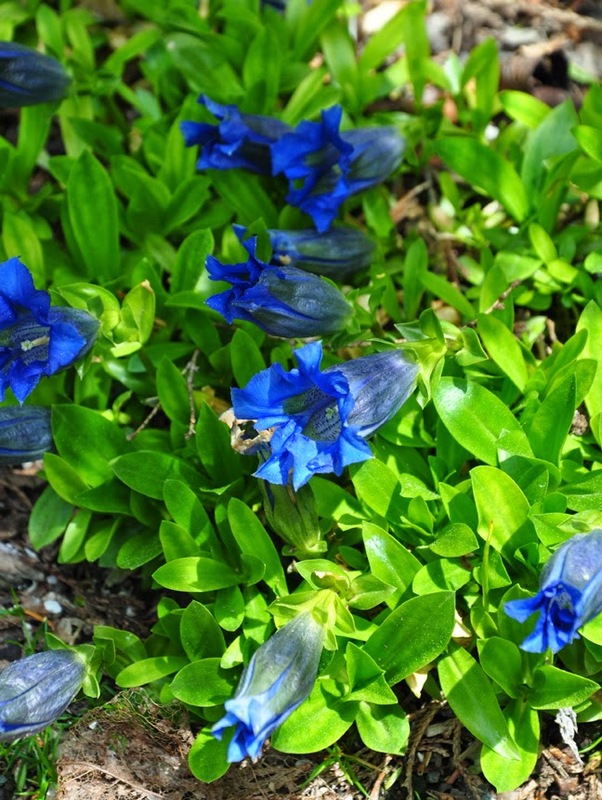 The leaves form a ground-hugging rosette and the spikes of flowers are the loveliest blue." Donna: "The terrace wall needed to be backfilled with crushed stone to provide drainage. The crushed stone also helps with freeze/thaw winter conditions here in Nova Scotia. Most years the wall requires a bit of spring maintenance in the way of repositioning a stone or two." "When completed we backfilled the walls with quality garden soil and compost. Then the fun began. The area gets full sun all day long and we filled it with sun-loving plants." Donna: "Duff chose a relatively flat spot and made a level pad of crusher dust. Over the winter it formed into a relatively solid base. 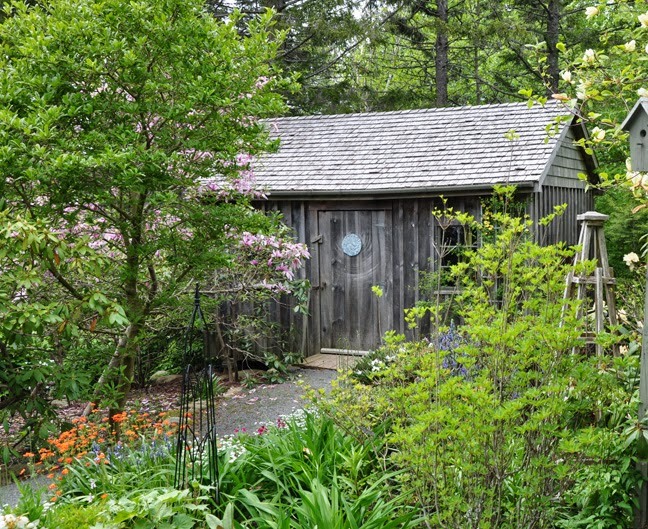 The shed is a board and batten construction with a cedar shingled roof. The windows were recycled. I only wish it were bigger because it is filled to the rafters." Donna: "Rosa 'Father Hugo' is an early bloomer and it does not repeat bloom. It is disease-free and low maintenance. I just have to cut it back from time to time so we can get to the shed. It has attractive reddish stems and great fall color. I have never seen it for sale in local garden centres. Ours came from a cutting taken from a friend's garden. Roses do not do well in our garden and so I am happy to have the lovely Father Hugo." Here's a link to Part 2 and Part 3.